Provide comfort for the family of Robert Virginas with a meaningful gesture of sympathy. 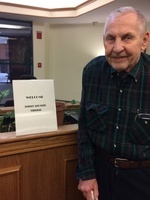 Robert Richard Virginas, 86, February 6, 2019, lifetime resident of the Southwest Side of Chicago, loving husband of the late Genevieve; cherished father of Barb and Sue; beloved and proud grandfather and great-grandfather of many. Cremation services have taken place in accordance with his wishes. A Memorial Service with a Celebration of Life will take place at later date. Memorial contributions greatly appreciated to Arbor Day Foundation, www.arborday.org, ASPCA, www.aspca.org, or PAWS, www.pawschicago.org. Please visit ROBERT VIRGINAS BOOK OF MEMORIES. To express your thoughts or memories in the online guest book, visit www.chapelc.com or www.facebook.com/centralchapel. Arrangements by CENTRAL CHAPEL-Chicago. For information call 773-581-9000. To send flowers in memory of Robert Richard Virginas, please visit our Heartfelt Sympathies Store.